Australian test batsman Phil Hughes was left in critical condition after a bouncer hit the back of his head and left him unconscious, currently he is in critical condition in sydney hospital. 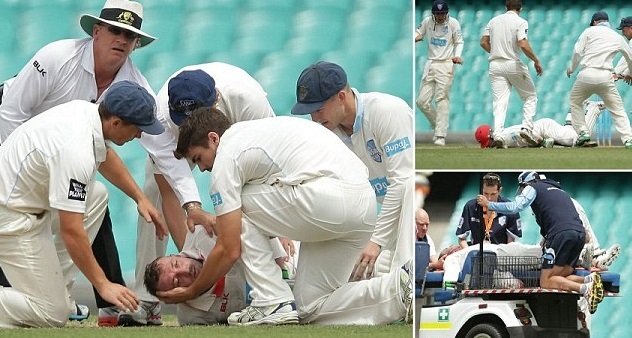 Hughes was playing for his domestic team New South Wales when a fast bouncer from Sean Abbot hit straight at the back of his head just under the helmet and he collapsed face first to the ground. Immediately it was evident that this is a bad injury and he was rushed to the sydney hospital. As the reports suggest that he was knocked out cold with this blow, and medical staff was on the ground for around 13 minutes and a CPR was used before the game was abandoned for the day and Hughes was taken to the hospital where he is in induced comma in critical condition. Hughes was wearing a helmet but still the fast ball bouncer had a major impact and he suffered a severe head injury, our thoughts are with him and we wish him full recovery soon. After today’s bad incident we take a look at some of the other nasty injuries suffered by cricketers onfield. Shoaib Akhtar was regarded as the fastest bowler ever in the history of cricket and Brian Lara and Kirsten found out the wrong way when they felt the full force of Shoaib’s bouncers. Lara survived the scare without much damage but Kirsten suffered a nasty cut on his chick bone plus a black eye. In the test match against Sri Lanka, chasing the same ball which was top edged by Mahel Jaywerdene, Steve Waugh and Gillespie came into each others way which resulted in nasty injuries to both. Steven Waugh had surgery on nose while Gellespie broke his leg. Zimbabwe bowler Keegan Meth suffered a bad knock when he was bowling and batsman hit a straight drive which hit in straight on his face, he lost four upper teeth and his jaw was dislocated as well.